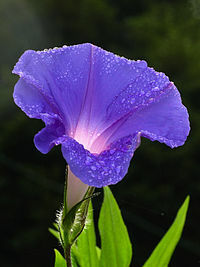 Morning glory is a family of common flowering plants known as Convolvulaceae which includes bindweed. Most morning glory flowers curl up and close during the warm parts of the day, and are wide open in the morning, like their name. On a cloudy day, the flower may last until night. The flowers usually start to fade a few hours before the petals start curling. They prefer full sun throughout the day. Some morning glories, such as Ipomoea muricata, are night blooming flowers. Ipomoea aquatica, known as "water spinach", "water morning-glory", "water convolvulus", "Ong-Choy", "Kang-kung", or "swamp cabbage", is used as a green vegetable.